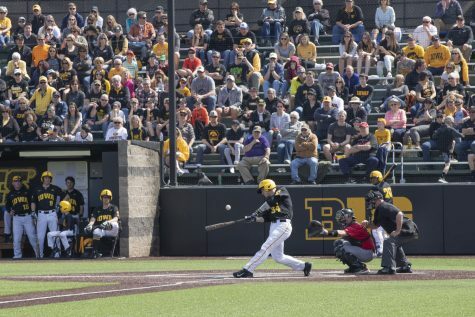 Pitching has been the driving force in Iowa’s midweek wins, and that remains the case as the Black and Gold hit the road to face Bradley. 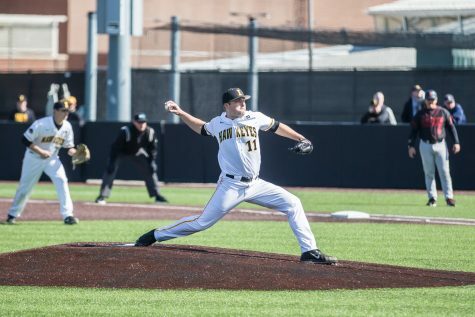 In Iowa baseball’s final game against Rutgers — a 15-3 loss — pitching was a focal point postgame. 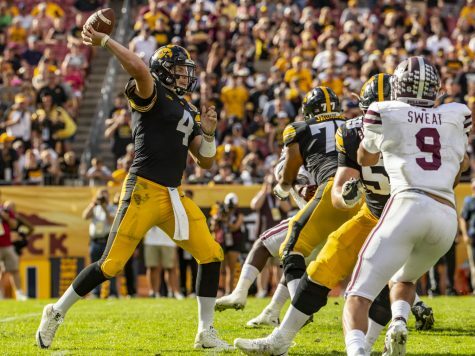 Today, Iowa will take on Bradley in Peoria, Illinois, at 7 p.m. and once again, the Hawkeye arms will be under the microscope. 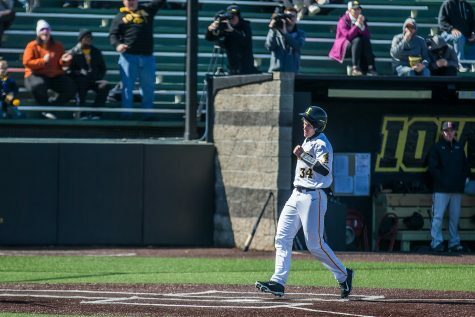 Iowa is 4-1 in its five midweek games, and in all four wins, a key pitching performance jumps out of the box score, and that’s no coincidence. The Daily Iowan takes a look at those midweek contests, breaking down the highs and lows from the mound. To date, this is the best all-around pitching performance of the season. Simpson managed just 1 hit in 25 at-bats. Hawkeye Clayton Nettleton got the start, and in his three innings, he gave up 1 run while notching a strikeout. Adam Ketelsen came in and took over for 2.2 innings, gave up the game’s only hit, and allowed Simpson’s final run. From there, Trace Hoffman, Shane Ritter, Kyle Shimp, and Drew Irvine closed out the game, combining to strike out three batters. The only downside to this game? Seven walks by the Hawkeyes. 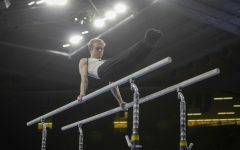 But all in all, it was a nearly hitless performance that gave plenty of arms new opportunities. 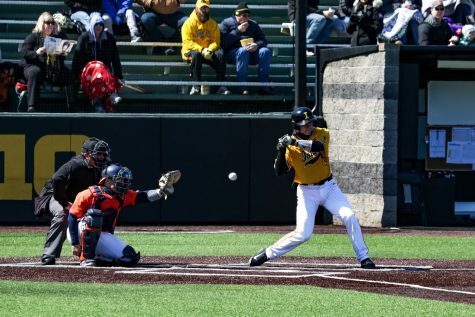 “We got some pitchers on the mound who hadn’t seen a lot of innings up until this point,” Iowa head coach Rick Heller said postgame. 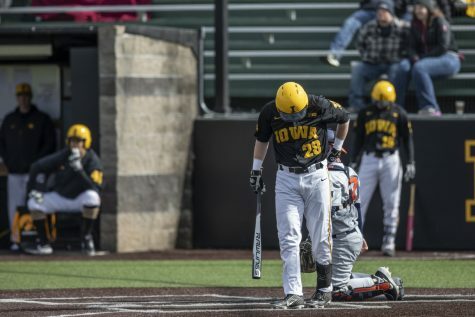 One day after allowing just 1 hit, Iowa found itself in a close game and needing a ninth-inning rally to come out on top. 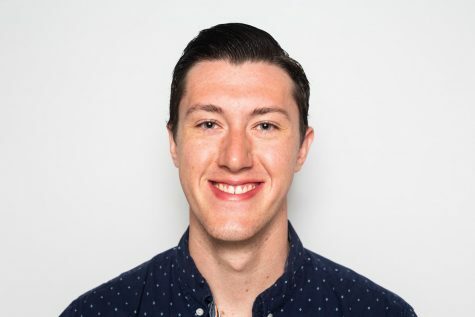 Trenton Wallace started for Iowa, and he gave up 3 runs in four innings. He did strike out six batters, though, and kept Iowa in a 3-2 ballgame until he stepped off the mound. 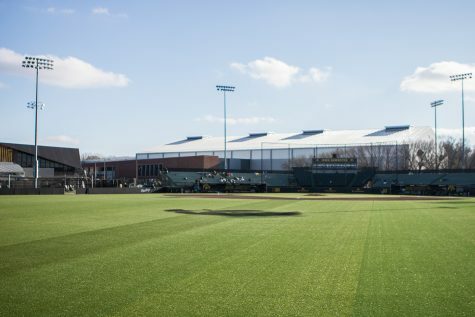 From there, Duncan Davitt put together a strong performance; the freshman threw three innings, struck out 2, and allowed just 1 hit in the Hawkeyes’ best pitching performance of the game. Iowa’s first two pitchers, Davitt and Hoffman, lasted a combined 3.2 innings. Bradley scored 2 runs and notched 4 hits while they were on the mound. However, when Wallace entered, the scoring stopped for good. The sophomore tossed 4.1 scoreless innings, allowing just 2 hits while striking out a team-high 6. Wallace’s 6 Ks tied his season high, which he set against Chicago State. Davitt stepped up once again, this time lasting five innings. He struck out 6 and gave up just 1 hit. 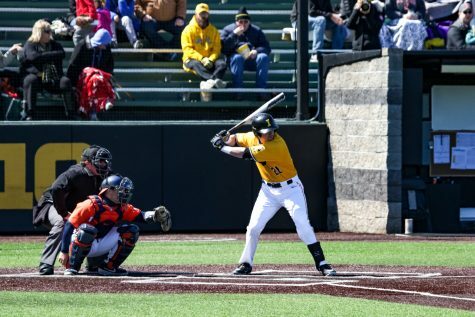 As a team, Clarke managed just 4 hits — fewer than half of Iowa’s total — but that was thanks to the efforts of Davitt, Ritter, Nettleton, Ketelsen, and Foster. Ritter and Foster didn’t allow a single run, tying the knot on another solid defensive midweek effort. 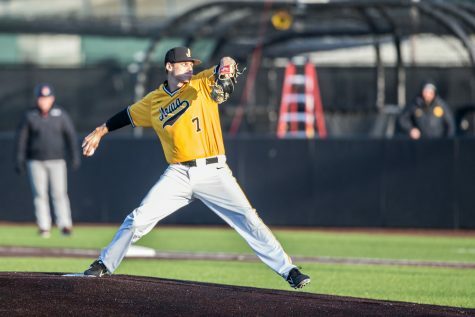 Things got shaky pitching-wise for the Black and Gold in the most recent midweek contest. 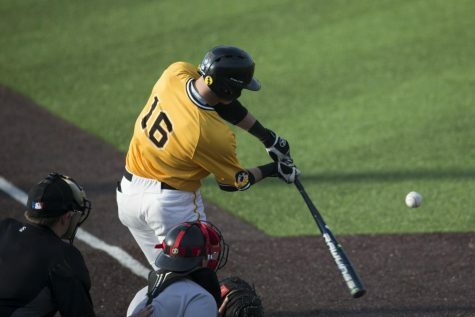 Being a back-to-back midweek game, the Hawkeyes ran thin on midweek arms, and it showed. Wallace started, but he lasted 2.2 innings after giving up 3 runs on 5 hits and striking out 4. 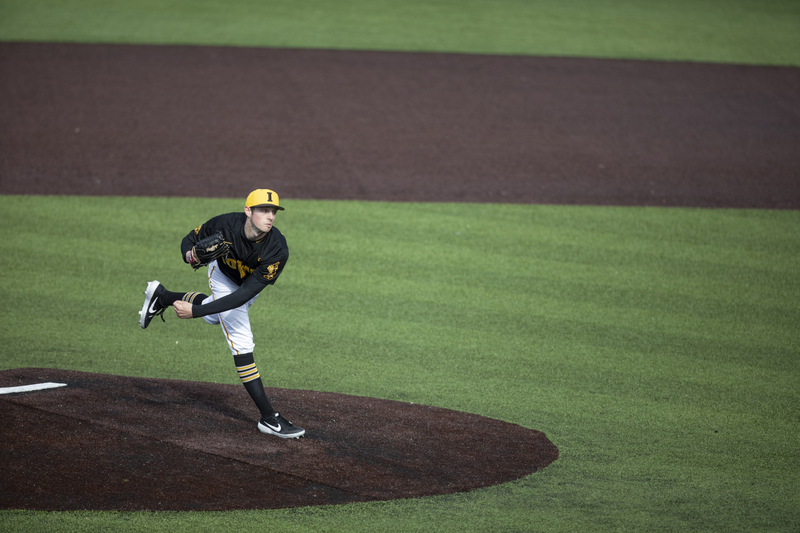 The Hawkeyes went through six more pitchers after he left the mound, but to no avail. All in all, Iowa pitchers walked 5, and all but two of the seven arms saw Illinois State plate at least 1 run.